End of May 2007 I visited the desolated and dried up port of Aral and found the new fish processing plant full of fish. I had to travel almost two hours by jeep to get to the sea, where I joined fishermen on the sea catching six different kinds of fish. 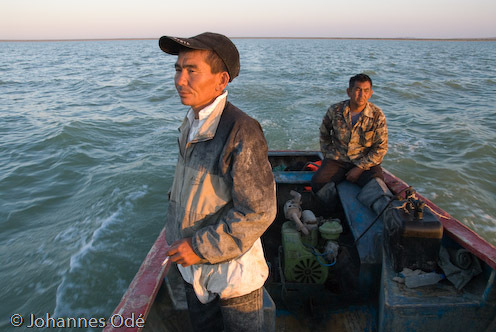 Thanks to a recent constructed dam between the northern and southeren Aral Sea and sluices along the Syr Darya river, life is coming back to the northern Aral Sea. Fish is exported again from this former fish pond of the former Sovjet Union.